Urban dwellers often take pride in, and some degree of ownership for the nature strip or roadside verge outside their homes. Mowing grass, edging the footpath and rubbish removal are common activities undertaken by the urban community. Rural landholders view their roadsides in much the same manner. Some even consider the roadsides close to their holdings as an extension of their driveway. The presence of litter amongst the roadside vegetation is no less distasteful to rural dwellers than it is to the urban community. The natural vegetation along our rural roadsides is both beautiful and uniquely Australian. 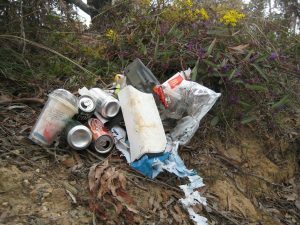 Locals and visitors alike do not wish to see litter on the roadsides, amongst our uniquely Australian landscape. Roadside litter may also cause injury or death to native animals which use roadside vegetation as habitat. Carelessly discarded containers can trap small mammals or reptiles. The consumption of small plastic items can suffocate any animal. Circular items such as those found on the tamper proof lids of plastic milk bottles can slowly strangle an animal as it grows. Those driving along our rural roads need to be observant for wildlife or livestock on the roadsides, which may stray onto the road and cause an accident. Rural landholders are often more observant of roadside activity, looking also for damaged fences, escaping livestock, weeds and feral animals. This heightened observational level makes the presence of roadside litter glaringly apparent. Sometimes rubbish may escape trailers, utes or trucks, but, on inspection, mostly this litter is a result of the disposal of fast food containers, bottles and cans once the contents are consumed. This has become a fact of life in Australia, and will continue to be so until penalties for littering are severe enough to dissuade the activity of casually tossing rubbish out of the car window. Surprisingly 94% of people surveyed identified litter as a major environmental problem! This pile of rubbish was picked up in 5 minutes along one of our rural roads. Despite the continued practice of littering there is a lot the community can do. Enjoy the sunshine, get some exercise and clean up our rural roadsides. Take a suitable container, walk one kilometer picking up rubbish as you go, cross the road and continue back to the starting point. Litter attracts litter. The presence of roadside litter gives the impression that the residents do not care about their environment. Therefore, if it bothers you, pick it up. There is no need to wait for Clean Up Australia Day, take action now and show pride in your local area. The feeding habits of the European carp, Cyprinus carpio, have a detrimental effect on water quality and create an unfavourable environment for other species. Carp are benthivorous fish that feed in and on sediment; this is destructive to aquatic plants, which provide critical feeding, spawning and nursery habitat for native fish, increases turbidity by suspending sediments, and mobilises sediment bound phosphorus. A new biocontrol agent to control this aquatic pest, which is now ubiquitous in all but the uppermost reaches of NSW waterways, is currently under investigation. Australia’s history of biological control hasn’t been unblemished and the public are being invited to have their say on the possible use of the use of a species-specific virus, Cyprinid herpesvirus 3. Central Tablelands residents are invited to attend a community briefing session to find out more about the National Carp Control Plan (NCCP), the research underpinning the biocontrol agent and how potential risks are being identified and mitigated, and to provide their feedback. The community briefing session will be hosted by the NCCP and Central Tablelands Local Land Services on Monday 27 November from 6-8pm at Bathurst Panthers Club. NCCP National Coordinator Matt Barwick says waterways are the lifeblood of many rural and regional communities and they need to be rehabilitated. “While these community briefing sessions are important for us to share the background, context and desired outcomes of the NCCP, they also provide an opportunity to hear from community members about how the prevalence of carp impact on them, their lifestyle or their business,” Mr Barwick said. “We value the opinions and beliefs of people in the Central Tablelands region and we want to understand the ecological values of affected river systems and waterways and any likely direct or indirect impacts, be they social, environmental, economic or cultural, that may eventuate,” Mr Barwick said. Central Tablelands Local Land Services is working with the NCCP to ensure local issues are considered in the National Carp Control Plan. “We encourage all members of the community to participate in this briefing session and ask any questions they may have in relation the plan. The NCCP is a process, not a foregone conclusion so we encourage residents to share their thoughts and opinions and help shape the recommendations to government,” said Senior Land Services Officer, Casey Proctor. This event is one of more than 40 community briefing sessions which will be held in NSW, Victoria, South Australia, the ACT, Queensland and Western Australia in coming months. To find out more about the NCCP visit www.carp.gov.au. For further details about the Bathurst Community Briefing Session contact Casey Proctor at Central Tablelands Local Land Services on 0429 110 072.